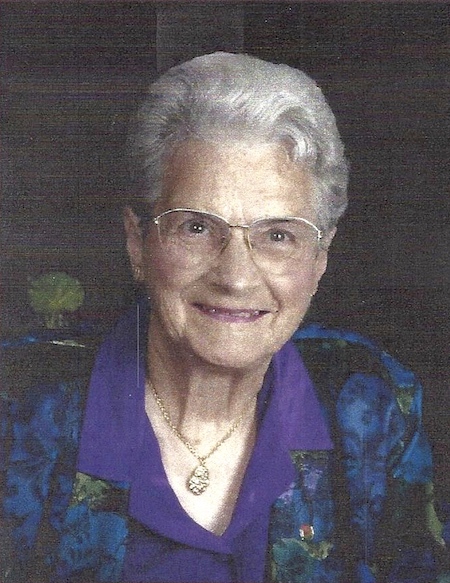 WOOSTER – Former Paulding County resident Anna Blanche Ankney, age 99-1/2, entered into the arms of her Lord and Savior Jesus Christ on Tuesday, Jan. 29. She was born on June 17, 1919 in Paulding County, the daughter of the late Theodore and Mae (Fockler) Renollet. On Sept. 29, 1937, she married Walter Ankney, who preceded her in death on April 26, 1994. She loved to travel and wrote many journals of her experiences. She was active in St. Paul Evangelical Lutheran Church helping in many areas such as providing food for the sick or new mothers, potluck suppers and transporting to and from church events. Grandma loved gardening and was active in various clubs and organizations including farm bowling league, card club and John Paulding Historical Society. She will be greatly missed by her loving family: daughter, Judy (Harry) Varner; daughter-in-law, Elizabeth Ankney; grandchildren, Donald (Linda) Ankney, Ronald Ankney, John Ankney, Tony (Kelly) Ankney, Sherry (Dan) Kaufman, Randy (Wendy) Ankney, Tamela Pratt, Aimee (Dennis Myerwold) Varner, Jeff Varner; 15 great-grandchildren; and friend, Paul Webb, who filled their life with joy. She also was preceded in death by her son, Larry Ankney; brothers, Ted, Junior and Irvin Renollet; and other dearly loved family and friends. A Celebration of Life will be held at a later date. Den Herder Funeral Home, Paulding, Ohio, is handling arrangements. In lieu of flowers, please consider a donation to LifeCare Hospice, 1900 Akron Rd., Wooster OH 44691 or Alzheimer’s Association. Aunt Annie fathers name was Lewis Doran and she was a caring funny lady. She will be sadly missed! This comment has been hidden due to low approval.